2. Thanks to everyone who prayed for my intentions the other day! The Abbot thankfully survived his comprehensive exams. Survived. That's all he's willing to comment to the general public. I was privileged to hear more of the nitty gritty and I can say that I sure don't envy him! Thankfully it's over, though, and it's made our weekend a bit less stressful! 3. Do you see these three young amazing men in their stellar habits for one of my absolute favorite religious orders? 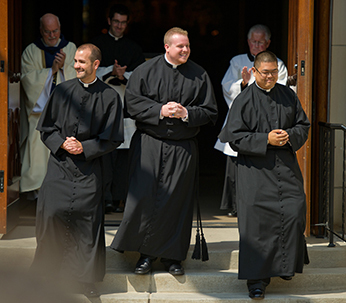 Today these three men were ordained Holy Cross priests!! Congratulations to Fr. Jarrod, Fr. Mark, and Fr. Brian! Please join me in praying for them as they begin their priestly ministries! I am so bummed that we couldn't make it up to South Bend for this ordination Mass, but I'll be eagerly awaiting the Mass video being posted on youtube. 4. The Abbot got to know Fr. Brian during out time at ND, and I got to know him through the Abbot, so we are especially excited for him! But really I'm excited for all three of them! Our family has been so incredibly blessed by the Holy Cross priests we've known and it just brings me such joy to know that there are now three more among their ranks. 5. Kind of feel like Baby Sister got jipped, though. The last time someone we knew got ordained from the CSC I was pregnant with Sister Stinky and she got the first priestly blessings of not one but TWO amazing young men! Poor Baby Sister...maybe we can take her to the diocescan ordinations when she's a newborn? 6. I have been meaning to post for quite a while about the fun Polish tradition of blessing a basket filled with the first foods of Easter (i.e. post-Vigil/Easter morning foods). We actually found a blessing of the baskets to attend nearby this year and it was so great! I grew up going to these, and our old parish had a sizeable Polish populations so they did them, but we were at a loss last year (although our pastor did bless our basket for us). Linking up to Jen and friends! Please pray for her as she prepares to increase the world's awesomeness with the delivery of another Fulweiler child!! St. Gerard and St. Gianna pray for us!